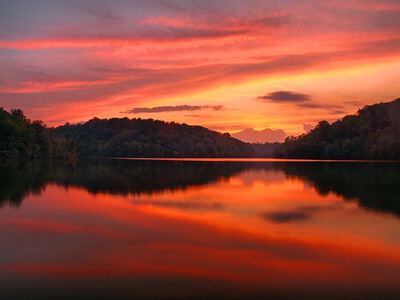 Located in South Covington, Kentucky, Doe Run Lake has become a favorite spot for me to photograph sunset. 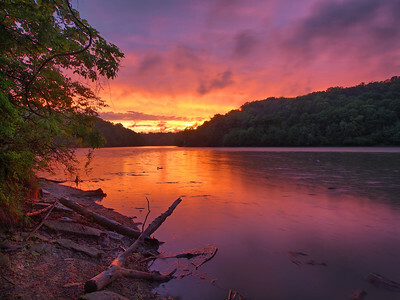 Doe Run Lake Kenton County Park Covington, Kentucky After a group of storms pushed through this evening I had a feeling that sunset had some serious potential so myself and good friend Chris Morris headed up to Doe Run Lake for some snaps. When we had arrived there was a large shelf cloud over top of the lake but it quickly moved out. Nonetheless, the light turned out to be very pretty. Little did we know when we left and got out onto KY 17, just a 1/2 mile away, the real show was going on as the shelf cloud that had moved out was a bright pastel pink/purple, but that's OK, I enjoyed the scene that unfolded before us. 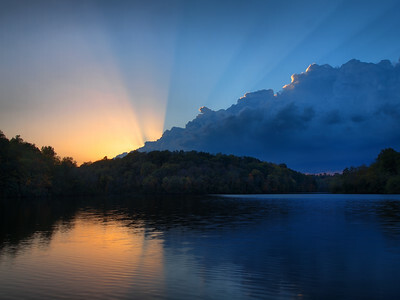 Doe Run Lake Kenton County Park Covington, Kentucky Last Sunday I finally got some sunset shots at nearby Doe Run Lake in Covington, Kentucky as when I arrived it was full on God Rays reflecting in the lake. Little did I realize that the show wasn't over. It was incredible watching it all change before my eyes as yellow gave way to orange which gave way to red and then finally pinkish purple. Normally when I set up at the lake I usually find a nice lakeside grotto surrounded by weeds and trees but everything happened so fast I ended up having to set up along the parking lot at first till I finally moved to the bottom of the boat ramp for this part of the show when the color just exploded. In all seriousness this was the best sunset I'd seen in some time. Doe Run Lake Kenton County Park Covington, Kentucky Sitting on the computer tonight I realized that sunset had some serious potential when I looked out the back window as the sun was a massive orange muted ball just above the horizon. 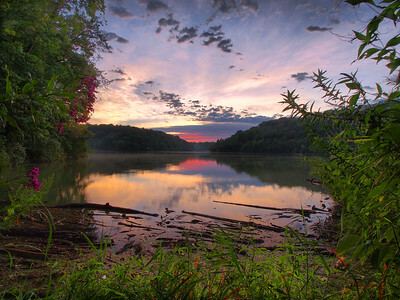 So off in the car I hopped shooting up to nearby Doe Run Lake in South Covington, Kentucky. As always I arrived to the show a little late but I enjoy shooting the after light of sunset rather than the sunset itself and there was plenty of light left to get some shots of the beautiful scene that greeted me when I arrived. Doe Run Lake Kenton County Park Covington, Kentucky With so many bright beautiful sunny days I've hardly been out shooting this August, however I have been running up to nearby Doe Run Lake in Covington, Kentucky to try and catch some sunsets. After several sunfails, yesterday evening a cold front was moving through and I noticed that sunset had some serious potential, so I hopped in the car and made the quick run up there. What I found when I arrived was a wow! Yellow skies and God Rays! Usually I run off to find a place to set up in the woods lakeside, but not this time. I hopped out of the car and ran to the edge of the parking lot and shot away, fearing that if I tried to find a wooded foreground I could miss this beautiful display that I had arrived too. Well, I was right, within a few minutes the God Rays disappeared and then began another show. One that went from yellow to orange to red to pink and from beginning to end turning out to be one of the best post-sunset displays that I'd seen this year. 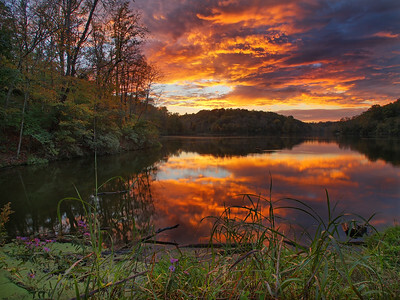 Doe Run Lake Kenton County Park Covington, Kentucky One evening back in early October I took the pup outside to do her business and I noticed things were looking pretty awesome over towards the lake, so I hopped in the Jeep and zipped over there. Boy, was it some high drama, thunder and swift moving doomy gloomy clouds. I couldn't believe the half and half scene that was before me. As I shot I began to realize the storm was moving in my direction so I ended up having to hop back into the Jeep and leaving since I had all the windows and doors off and I didn't feel like hiding in the stinky restrooms. I'm still kicking myself for choosing the wrong vehicle. Doe Run Lake Kenton County Park Covington, Kentucky At about 10 till 8 tonight I took Maggie The Wonderpup out in the yard for her evening potty time, whenever it's that late in the evening I always check the sky to see what's happening with both the light and the clouds and things were looking pretty darned promising. While Maggie sniffed around and did nothing for several minutes I mulled over if I wanted to run up to Doe Run Lake or not, finally deciding on going. So a short time later Lisa, The Pup and myself hopped in the car and off we went and goodness was it worth it. 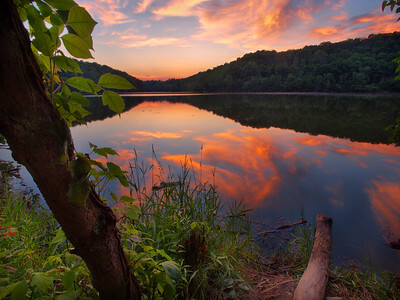 Doe Run Lake Kenton County Park Covington, Kentucky I'm glad that it's lakeside sunset season again! Yesterday evening after some storms pushed through with some heavy rain I could see from my back window that sunset had some serious potential. So I called my good friend Chris and asked him if he wanted to meet me up at Doe Run Lake a short distance from both our houses. Chris said he did and I told him I'd be up there shortly. I knew I had about 45 minutes till sunset and took Maggie out for a quick restroom break which turned out to be a big sniff fest instead of what needed to be done. Eventually the pup did her business and I was soon to discover how ill prepared I was for a running out the door for a quick set up. After finally getting my stuff together, getting out the door the sky was already aglow with a bright orange tint and to make matters worse I got stuck driving behind some leisurely UK fan. When I finally made it to the lake I could see Chris was already there and somewhere lakeside. The color in the clouds was really going now and even though it was steadily raining there was still a great reflection in the water. It didn't take me long to find Chris and he'd found the perfect perspective and to make things even better the lake still hadn't fully filled back up from it's winter draining so there was plenty of room to walk lakeside to find a spot capture one beautiful sunset. 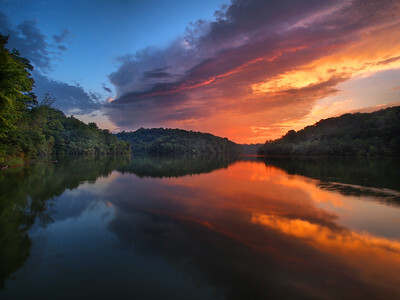 Doe Run Lake Kenton County Park Covington, Kentucky I was on the fence as to whether it would be worth running up to Doe Run Lake for sunset last night, it had been a mostly cloudy day, but as the sun was setting I noticed a lot of the clouds were dissipating. After mulling it over I finally decided to go ahead and make the quick jaunt up to the lake. The last few weeks have been ridiculously busy and I had watched several stunning post sunset events pass by, not being able to take advantage of it. The drive only takes about 5 minutes and once I got there it was really crowded as it looked like there had been some canoe event, however I was happy to see that all the canoes were out of the water. A new accessory I'm carrying with me is a 2 ft long machete that I've been using to remove the occasional stray foliage that can find it's way in a photo. After strapping it to my belt I began to head out and as I glanced around I noticed that several people were staring at me with a concerned look. I chuckled to myself and headed out on the trail. 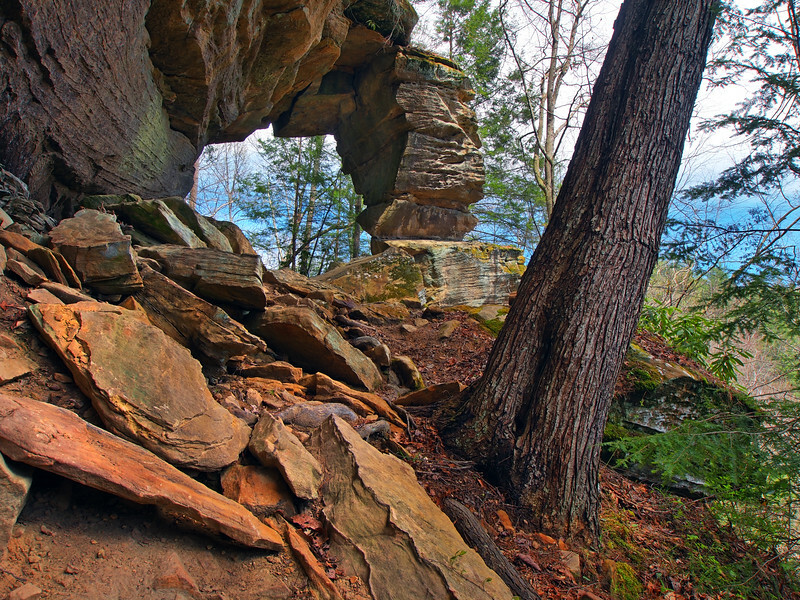 Since I shoot here quite often in the warmer months I thought I would scout out a new place to set up and after a short time I found a spot that I liked. When I set up I felt there was a decent chance for some color on the remaining clouds and I set up trying out different compositions. Within a few minutes the clouds lit up and a still wind rested upon the lake creating perfect reflections. A perfect way to end a very busy month. 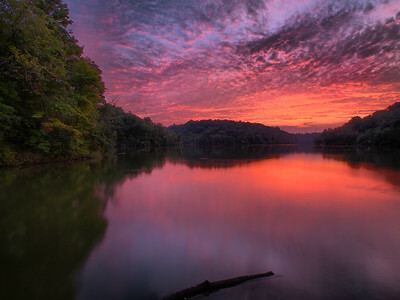 Doe Run Lake Dam Kenton County Park Covington, Kentucky Tonight I saw the brightest rainbow I've ever seen in my life! 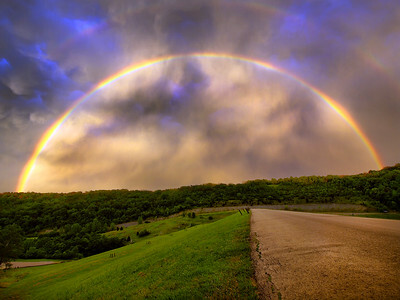 To top off this epic rainbow, I witnessed epic lightning passing through the rainbow, epic clouds, and an epic sunset. For the first time in a long time I was completely overwhelmed as a photographer. There was so much happening I just had no idea where to shoot! This is one of my first shots of the evening, as I topped the dam in Covington's Doe Run Lake, I just got out and started shooting. What an experience! Doe Run Lake Kenton County Park Covington, Kentucky This evening was perfect end to a perfect weekend, as after dropping my Lisa off at home after fantastic day running around the Camp Springs Herbst Tour, I made a quick run up to Doe Run Lake and captured a gorgeous sunset, quite possibly the last of the year from here as soon the leaves will be off the trees and you can see the homes that they hide. I'm sure not many folks have ever had as an eventful week as I had, starting with last Sunday when my daughter gave birth to a bouncing baby boy, Rhydian (rhymes with meridian) Oaken and then this past Saturday I proposed to my wonderful other half Lisa (who said a tearful and joyous "Sure, why not!") at the end of a perfect photoshoot by my good friend Danielle Bachman at the Stonebrook Winery in Camp Springs! Yep, I'm still coming down from an awesome series of events and a couple of the best days of my life! 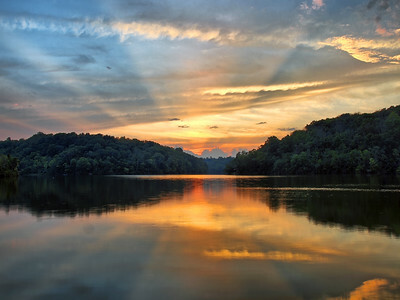 With so many bright beautiful sunny days I've hardly been out shooting this August, however I have been running up to nearby Doe Run Lake in Covington, Kentucky to try and catch some sunsets. After several sunfails, yesterday evening a cold front was moving through and I noticed that sunset had some serious potential, so I hopped in the car and made the quick run up there. What I found when I arrived was a wow! Yellow skies and God Rays! Usually I run off to find a place to set up in the woods lakeside, but not this time. I hopped out of the car and ran to the edge of the parking lot and shot away, fearing that if I tried to find a wooded foreground I could miss this beautiful display that I had arrived too. Well, I was right, within a few minutes the God Rays disappeared and then began another show. One that went from yellow to orange to red to pink and from beginning to end turning out to be one of the best post-sunset displays that I'd seen this year.